In an era marked by global migration, war refugees, and terrorism, it is more important than ever to understand both how the uprooted, displaced, and re-located find ways to constitute community and how receiving communities constructively incorporate new residents. What are the tensions that human mobility generates? How do constructions of place affect the well-being of uprooted and host communities? How do our policies, institutions, and physical environment as well as our everyday performative strategies impact the lived reality of long-term residents and new arrivals? Who is included and excluded from the process of community formation, and why? What performative phenomena impede community formation? Where in our existing social structure do we find opportunities for performative interaction across difference? How does placemaking at the grassroots level interact with city or state-level initiatives to engineer attractive and welcoming environments? Be the Street seeks to respond to these urgent questions by developing performance work in partnership with local communities in order to reflect upon the making and re-making of place. The team currently consists of postdoctoral researcher Moriah Flagler (Theatre/Comparative Studies) with faculty members Ana Puga (Theatre/Spanish and Portuguese) Katey Borland (Comparative Studies), and Paloma Martínez-Cruz (Spanish and Portuguese). For 2016-18, the research team was led by Ana Puga (Theatre/Spanish and Portuguese) with co-investigators Harmony Bench (Dance), Katey Borland (Comparative Studies), Elena Foulis (Spanish and Portuguese), Paloma Martínez-Cruz (Spanish and Portuguese), and Shilarna Stokes (Theatre). 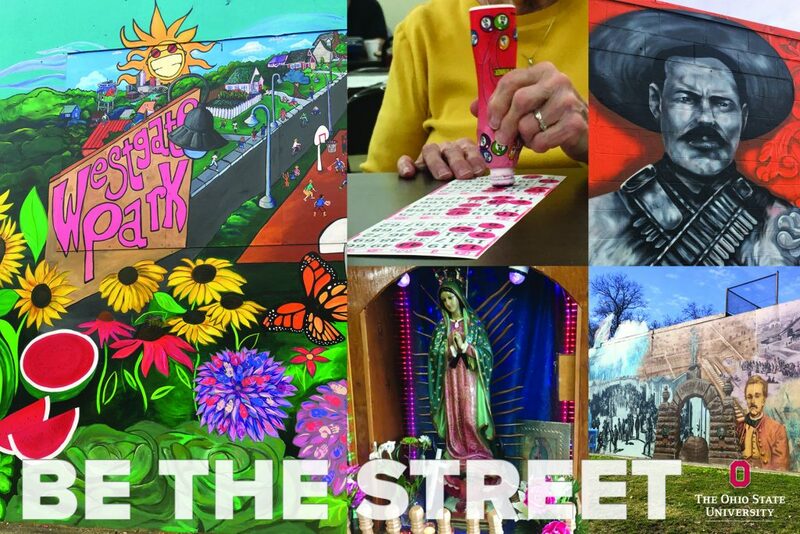 Be the Street is a Humanities and the Arts Discovery Theme Project at The Ohio State University.